Adds motion, light and sound effects to your model. You can create sequences of motion and light synchronised to your sound effects. Plays any common sound file. Easily programmed – no experience necessary. New! See our page on Scale Modelling Now Magazine. 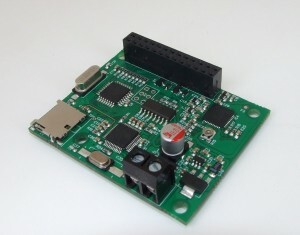 With videos of Smart-Fx in action and a competition to win a complete Smart-Fx model base. The SD Card contains instructions for each ‘channel’ in an easy to read text file. A channel may be a motor or an LED. 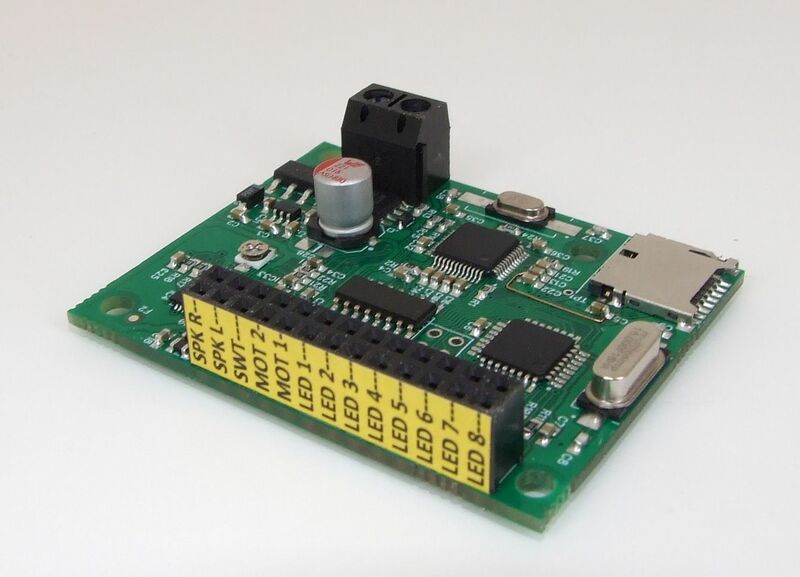 When the start button is pressed, the Smart-Fx controller starts playing the sound file and operates the LEDs and motors according to the channel instructions. N means turn on, O means turn off. the numbers are time in hundredths of a second. Q means start again from the beginning of the file. This example simulates a strobe light flashing twice, then pausing for half a second, then repeating. R means Ramp. The first R instruction increases the motor voltage from 0 to 100% over 5 seconds and the second R instruction reduces it from 100% to 0 over 1 second. S means “Set” and sets the voltage to 0 for 2 seconds. Then the sequence starts again. When the sound has finished playing, all channels are switched off and the Smart-Fx controller goes into a low-power sleep mode until the start button is pressed again.